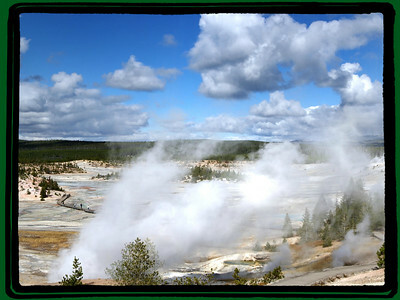 Yellowstone National Park (Our 1st visit-Sep 30-Oct 7, 2012) is America's first and foremost National Park, established in 1872 by the United States Congress for the preservation of its many wonders and for the enjoyment of the people. 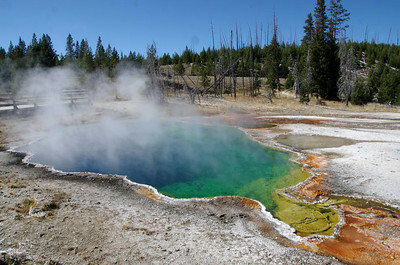 Yellowstone is a treasure that inspires awe in travelers from around the world, boasting more geysers than anywhere else on the globe. 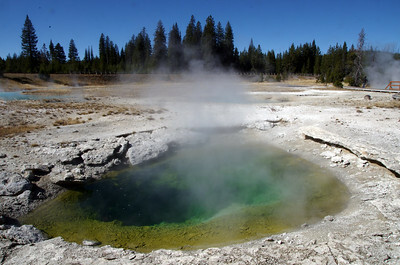 Long before any recorded human history in Yellowstone, a massive volcanic eruption spewed an immense volume of ash that covered all of the western U.S., much of the Midwest, northern Mexico and some areas of the eastern Pacific. 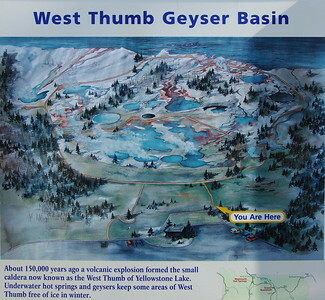 The eruption dwarfed that of Mt. 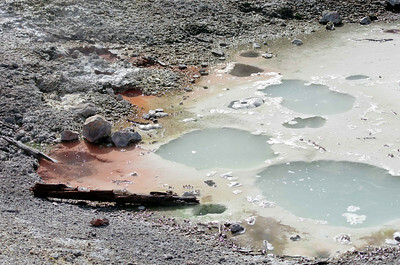 St. Helens in 1980 and left a caldera 30 miles wide by 45 miles long. 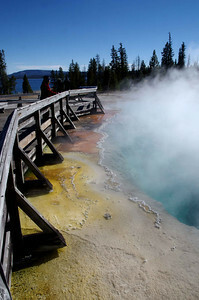 That climactic event occurred about 640,000 years ago, and was one of many processes that shaped Yellowstone National Park--a region once rumored to be the place where hell bubbles up. 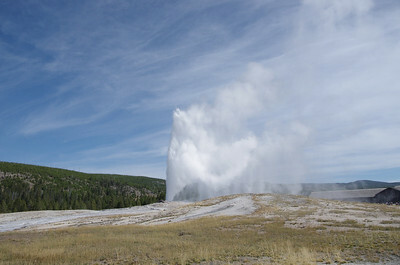 Geothermal wonders, such as Old Faithful, are evidence of one of the world's largest active volcanoes. 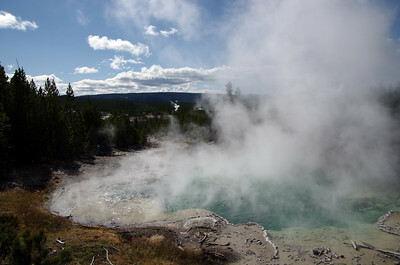 These spectacular features bemused and befuddled the park's earliest visitors, and helped lead to the creation of the world's first national park. 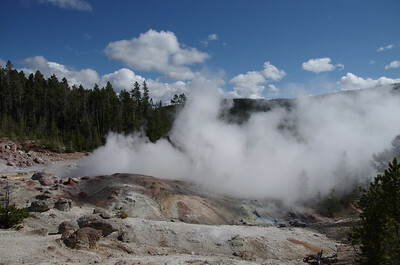 Fur trappers' fantastic tales of cauldrons of bubbling mud and roaring geysers sending steaming plumes skyward made their way back east. 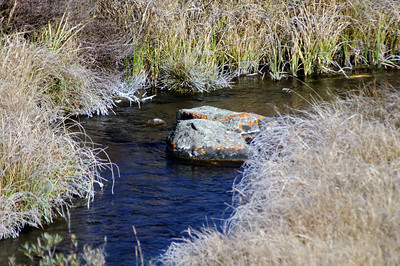 A frosty morning along 191 through the western edge of Yellowstone on our daily drive from Big Sky, MT to the park. 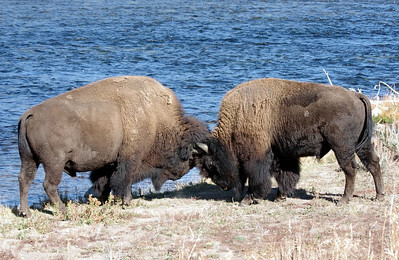 Don't try to stare down a buffalo. 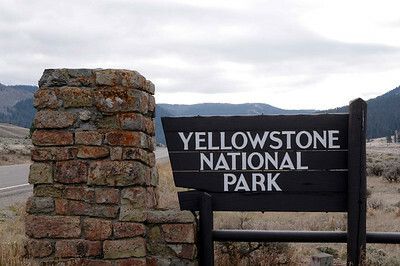 The Yellowstone Park bison herd in Yellowstone National Park is probably the oldest and largest public bison herd in the United States. 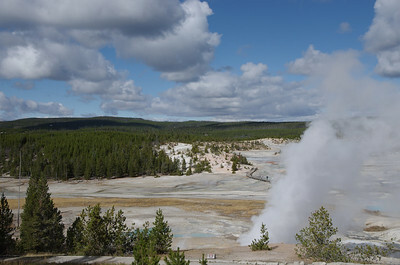 Yellowstone is known for its geothermal activity and large mammals, especially elk, wolves, American bison, bears, pronghorns, moose and bighorn sheep. 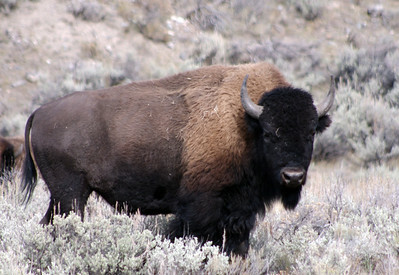 The Yellowstone Park bison herd was estimated in 2011 at approximately 3,700 individuals in two major sub-herds. 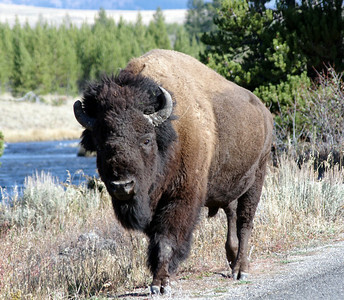 The bison in the Yellowstone Park bison herd are American bison of the Plains bison subspecies. 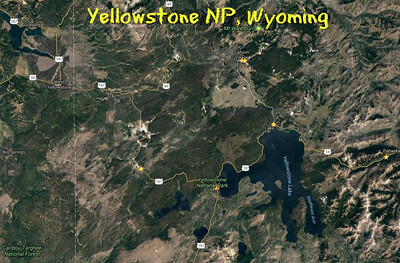 Yellowstone National Park may be the only location in the United States where free-ranging bison were never extirpated, since they continued to exist in the wild and were not re-introduced, as has been done in most other bison herd areas. 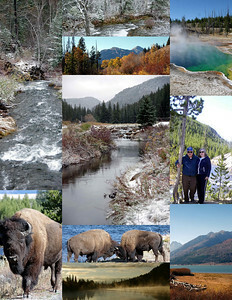 Other large free-ranging, publicly controlled herds of bison in the United States include the Wind Cave bison herd (approximately 350 animals), the Antelope Island bison herd (approximately 550 to 700 animals), the Henry Mountains bison herd in Utah (400 to 500 animals), and the National Bison Range herd near Flathead Lake, Montana (400 animals). 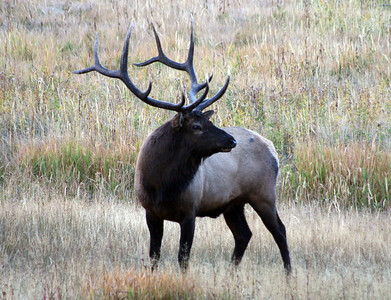 Bull Elk in Yellowstone NP Yellowstone provides summer range for an estimated 10,000–20,000 elk (Cervus elaphus) from 6–7 herds, most of which winter at lower elevations outside the park. 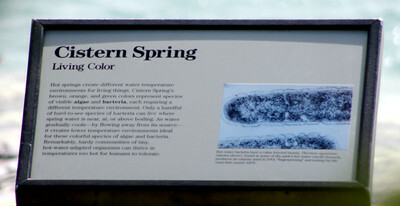 These herds provide visitor enjoyment as well as revenue to local economies through hunting outside the park. 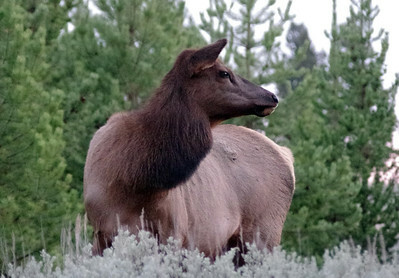 As Yellowstone's most abundant ungulate, elk comprise approximately 90 percent of winter wolf kills and are an important food for bears, mountain lions, and at least 12 scavenger species, including bald eagles and coyotes. 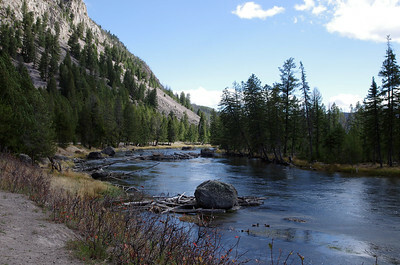 Competition with elk can influence the diet, habitat selection, and demography of bighorn sheep, bison, moose, mule deer, and pronghorn. 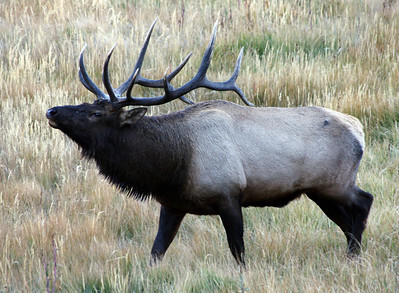 Elk browsing and nitrogen deposition can affect vegetative production, soil fertility, and plant diversity. 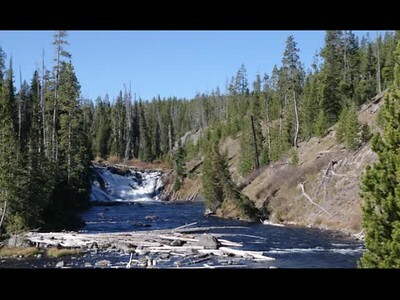 Thus, changes in elk abundance over space and time can alter plant and animal communities in Yellowstone.